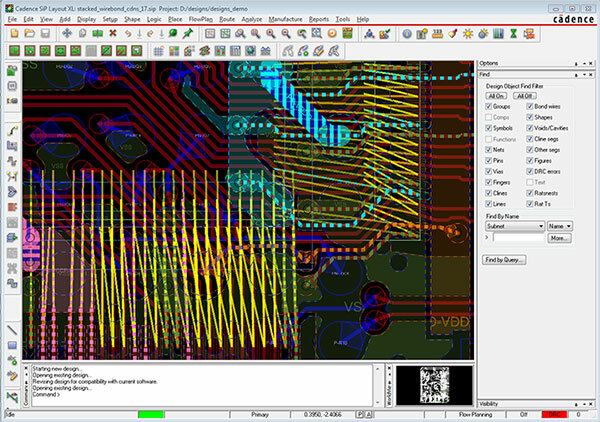 Cadence® SiP Layout provides a complete constraint- and rules-driven substrate layout environment, including full 3D design visualization, verification, and editing capabilities. Direct integration with Cadence OrbitIO™ Interconnect Designer provides the rapid implementation of proven interconnect pathways and die/BGA assignments. Cadence SiP Layout is a complete physical design and manufacturing verification solution for complex 3D SiP package design, including die bump array/BGA integration refinement using die abstracts. Supporting all popular package interconnect and assembly methodologies, SiP Layout provides comprehensive constraint-driven layout of the package substrate. Since it must operate in a 3D world, SiP Layout allows stack assembly optimization with 3D layout and editing. It also contains a powerful set of auto-interactive routing features that speed timing closure of critical interconnects such as DDR3, etc. Intelligent automated flip-chip die breakout reduces time-consuming and tedious manual breakout. Comprehensive DFM and DFA checking and modification improves substrate yield and prevents manufacturing assembly issues. Design review documentation and debug, followed by direct manufacturing tapeout, completes the package.